Skin allergies, which can be painful and frustrating, are a symptom millions of people suffer from worldwide. In spite of this, many people are unsure of what they can do to relieve their symptoms. Fortunately, there are ways that you can ease you suffering from skin allergies in the comfort of your own home, and in a natural way. Continue reading for five great tips on soothing skin allergies. Smoking can cause a great deal of damage to your skin. Not only does it exacerbate the irritation caused by skin allergies, but it can accelerate skin aging on a significant level, as well as worsening your overall health. Limit the amount of alcohol you drink, too, as this can also increase skin irritability. Olive oil is a wonder food for a number of reasons, and one of them is the soothing effect it can have on allergy-induced skin irritation. Applying olive oil will not only moisturize the skin, but can relieve itchiness and inflammation. Olive oil can also help improve rashes caused by skin allergies. A lot of cosmetic products contain potentially harmful chemicals, which can cause further irritation to allergy-prone skin. However, if you do have to use cosmetics, then choose herbal-based products made for your skin type, especially if your skin is sensitive. Applying a cold compress directly to a fiery and irritated area of the skin can help to soothe and calm the rash. Alternatively, a short cold shower can also provide relief: simply make sure to gently pat the skin dry once you have cooled it down, and then to apply moisturizer, in order to get immediate relief from skin allergies. 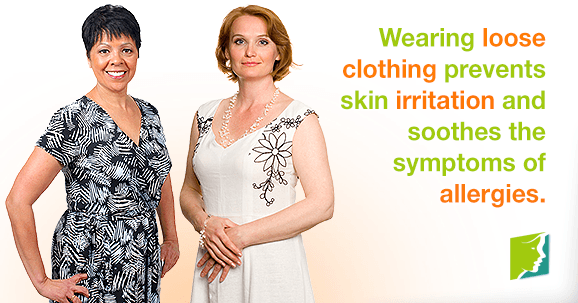 Wearing loose clothing - especially if made from natural fabrics - is one of the easiest ways to prevent irritated skin from suffering from the symptoms of allergies. Do not wear tight fitting clothes; they can aggravate your skin, especially if you have a rash. Likewise, synthetic fabrics like nylon or polyester can also trigger a rash, especially in hot climates. Instead, wear cool and loose fitting clothes in breathable fabrics. Many people suffer from a skin allergy at least once in their lives, but for many, these can be a recurring ailment. Despite being a common condition, lots of skin allergy sufferers are unsure of what they can do to remedy the problem. By following these five top tips, you will be able to help reduce and soothe the symptoms of skin allergies.